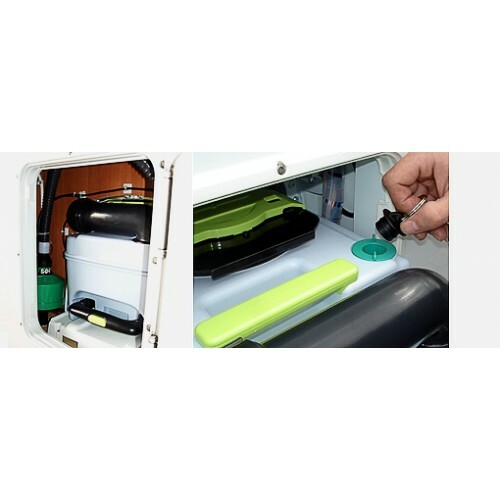 The SOG®II compact system offers a multitude of different options when it comes to ventilating your toilet. 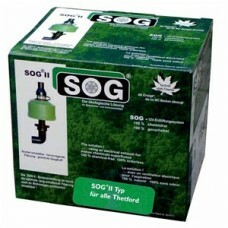 The unit is comprised of a replaceable filter cartridge that is inserted into the ventilator. The system's fan is fitted into the seal of the filter and is therefore barely audible. 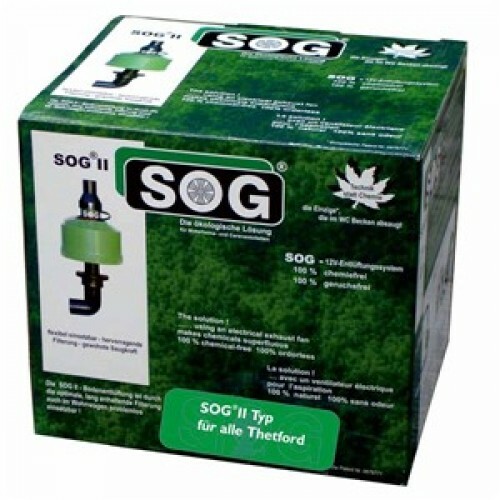 The SOG®II offers the advantage that the filter cartridge can be stored in a wide variety of different locations in your camping vehicle and ventilated through the floor of the vehicle in any position (e.g. in the garage, under the seat, in the double floor or in the storage compartment). 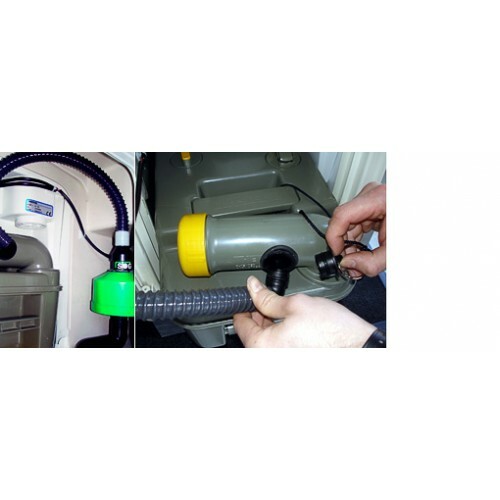 A hose or pipe extension (up to three metres away from the toilet) can be attached both in front of the compact system and to its floor outlet in order to find a suitable position. The fact that the filter unit is placed inside the vehicle means that no changes need to be made to the vehicle exterior and the system does not need to match its exterior design. The combination of the filter case's specific technical design and the system's flow mechanics, the huge filter area produced by this combination and the composition of the active charcoal are all so efficient that they enable the system to completely neutralise the odorous air removed by suction. 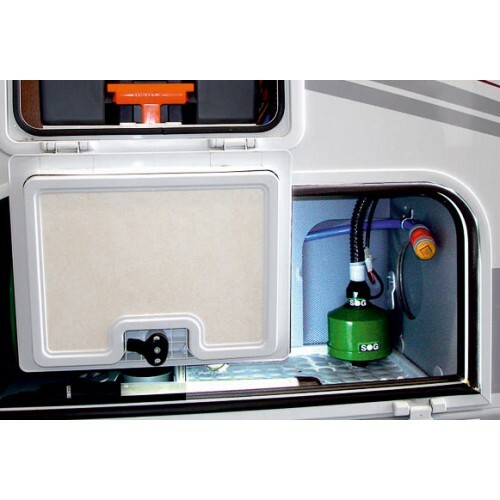 If you have a caravan in which your toilet's service hatch opens out into the awning, you can therefore rest assured that the SOG®II floor model is the ideal trouble-free solution for you. 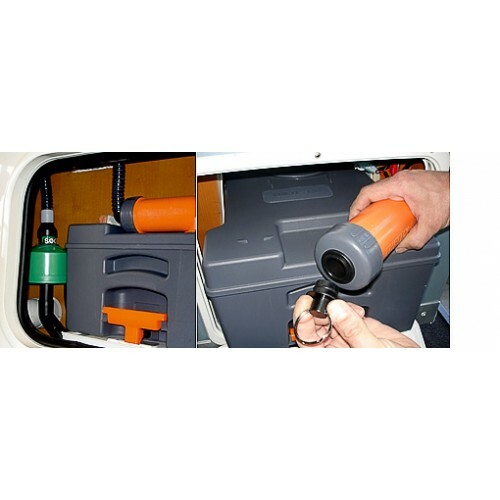 The cassette is just as easy to empty as it was before, namely by removing the exhaust hose and using the suitable plug that is supplied with the ventilation system to close the connection that is now open.